Originally published in SanJose.com Feb. 4, 2011. The photos really make this story. 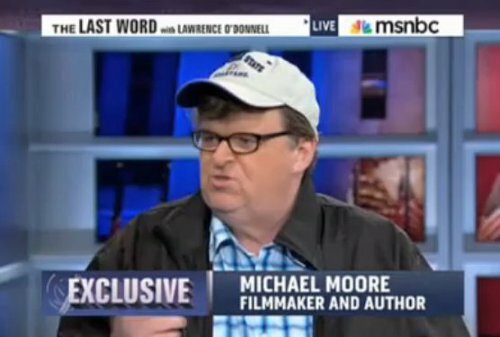 Michael Moore has proudly worn his Spartans cap since receiving it along with the Steinbeck Award in San Jose last October. Moore received the Spartans cap at a Q&A session with SJSU students. It takes a big man to change up his favorite cap. Last October, on the same day that Sarah Palin made a fundraising appearance at the Center for the Performing Arts and the Marriott, filmmaker Michael Moore was given a warm San Jose reception at the Morris Dailey Auditorium and received the John Steinbeck Award for his fearless work and societal contributions. In addition to the prestigious award, Moore left with another parting gift—an SJSU Spartans cap. 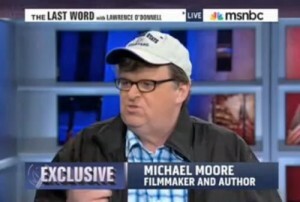 Much to the delight of San Joseans, it appears as though Moore has put his Michigan loyalty on hold, sporting his San Jose Spartans cap on virtually all of his recent national television appearances including The Last Word with Lawrence O’Donnell, Real Time with Bill Maher, Anderson Cooper 360 and The Rachel Maddow Show.